So I've been back for over a week now and guess how many pictures I've downloaded from my camera? What's that you say, did I even take pictures? Why yes, I did! I know, shocking, but I did. Not surprisingly, my husband has put up his pictures... and after seeing his, I'm not sure I need to put up mine! But I will b/c I'm pretty sure he's not the only one with an artistic eye (haha). So until I get my act together feel free to peruse his photos and drool over the food we ate! So what else can I tell you before I forget? Oh our day trip to Kofu. The friend we were fortunate enough to hook up with during our first few days in Tokyo is from a smaller town/city north of Tokyo near Mt. Fuji, who happened to be going home for the second weekend of our trip and invited us to show us around. After spending a lot of time in Tokyo we figured it would be a great opportunity to see a place off the beaten path and to get a guided tour of it. The area is also known for their wine (I know, who knew Japan had wine), and our guide's family happened to own one of the major vineyards and labels. 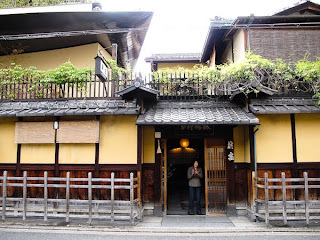 While in Kofu we got to taste some of their wines and hang out in the quaint city. There isn't a whole lot to see, but it was fun to get out and away from the hustle and bustle of Tokyo. Ok, I need to get cracking on getting my pictures uploaded. So I'm back from Japan and have LOADS more to say... but I just wanted to share w/ everyone the very adorable (very unnecessary) addition to my shoe collection. 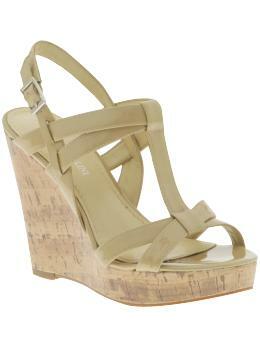 I went into the store to look for running shoes (which I desperately need) and instead came out with these! But can you blame me? They're adorable and even though they have 2 components that my husband dislikes in shoes -wedge heels and cork soles -I am keepint them. I totally deserve a new pair of shoes, right? Wow, what can I say about Osaka.... it was visually and gastronomically amazing. In Osaka there is an expression, kuidaore, which literally means to bankrupt yourself with food and if that is what we set out to do, I believe we succeeded. Osaka is the culinary capital of Japan and definitely earns a spot on the top of our list. At first glance Osaka is very similar to parts of Tokyo -the large crowds of people, the loud flashing/blinking lights, but it is also quite different. The flash is flashier and the noise a bit louder, less reserved. Here you can find streets that are really just pedestrian ways lined with shops and restaurants and lots of street food. We were determined to try to eat as much of it as possible and to get the full kuidaore experience. First on our list was the octopus balls, these can be found on every street corner and are a delightful ball of dough with octopus pieces in the center. They are then topped with bonito flakes, some sort of sauce (like the unagi eel sauce) and seaweed flakes. Completely delicious, but completely like little balls of molten goodness, these suckers are HOT! That is one thing I have noticed while in Japan... the temperature of hot foods and drinks border on scalding, so you really have to be careful and patient before digging into whatever you ordered. Then there was okonomiaki, which is a Japanese savory pancake with octopus. Also cooked on a flat top on the street... equally as delicious and very similar to the octopus balls. And of course to round it all out, a little dessert. These charming little waffle like cookies, that were filled with either chocolate or custard. Both equally delicious. Street food in Osaka was a success! Of course we were there 2 days, so we had a lot more eating in front of us. We wanted to try conveyor belt sushi, which we all enjoyed. It definitely isn't the best quality sushi, but at 130 yen per plate, it's fast and cheap and a good way to see everything before you eat it. We also got to experience a Hanshin Tiger sushi bar, which was some of the best (and freshest) sushi I've ever eaten. The whole experience was amazing and if you're ever in Osaka especially during baseball season, this is the place to go. The staff was amazing and even though they don't speak English, and have zero English on their menu we were able to order a delicious and diverse dinner along with plenty of beverages. The Hanshin Tigers lost that game, but we definitely came out winners. We're already more than halfway done with this trip, which is unbelievable. Obviously this trip has been busy, so I am VERY behind on posting and am instead just trying to soak in all in while I can... Let's see what's happened since I last posted... oh yah, LOTS! After a few days in Tokyo, we took the high speed train to Kyoto for two amazing nights at a Ryokan (Hirogiya). It was absolutely gorgeous, but the best part was the kaiseki meal provided. Here is the front entrance of Hirogiya and you can tell that while traditional, it is well cared for with attentive staff and a homey-ness to it that you wouldn't expect (or at least I wasn't). Our stay at Hirogiya requires its own post, and at some point I will come back to it to talk about the whole experience because there really is a lot to say! We ate lunch on our first day at the amazing soba noodle shop down the street that has been in business making handmade noodles for 300 years. Eating there seemed like a step back in time and in complete contrast to the craziness we had just left in Tokyo. Out time in Kyoto was too short and we missed a lot of things, which I'm a little disappointed about. We did however take a day trip to Nara, which was well worth it. 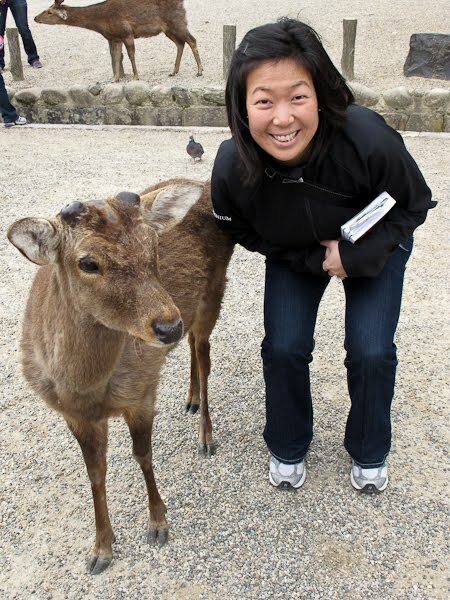 Nara is celebrating their 1300th anniversary this year, so it seemed like an extra special time to go. Nara is everything people tell you it is... beautiful and serene, and full of deer! We didn't do much of anything off the beaten path -just stuck to the basics since we were only there for a short period of time. I will say that even though you know that the deer are everywhere, it was still pretty remarkable to see and experience. So after our side trip to Nara we spent most of today trying to take in as many of the Kyoto sites as possible. Unfortunately for us, that wasn't very many. I guess it gives us a reason to come back, but still kind of disappointing that we couldn't see more. Now we're in Osaka and wow, this already is something else. We haven't seen too much of it, but I'm looking forward to delving into it deeper tomorrow! Harajuku ended up being quite the experience! We knew that Sunday was the day to go to experience it fully, but we were not prepared for what was ahead. The Harajuku area is well known for the youth that hang out here and for their distinct style of dress. The harajuku girls are known for their school girl outfits or as I call, "little bo peep" ensembles, but Sunday is the day for"cosplay" or costume play, where they dress up as anything resembling anime characters, in cyber punk gear or really anything that would be described as a little crazy. This seemed like an interesting thing we should experience... what we weren't expecting was the incredible amount of people that were in the area. I have experienced large groups of people before in small spaces and I feel pretty confident in saying that I'm ok with crowds. I'm fairly patient and realize that we are all just trying to get from here to there, so there is no need to push and as long as everyone stays calm and orderly, that will happen in a relatively timely manner. Well Harajuku this particular Sunday was crazy. To say the street was crowded would be a great understatement. It was literally a sea of people -a sea of bodies that wanted to go in every direction possible, cutting in front of you to pop into the shop or to race past you to meet up with friends ahead. They were walking in every direction, which made it that much harder to navigate. It was impossible to take regular sized steps and impossible to swing your arms without hitting at least 5 people. To put it in perspective, it made Shubuya crossing seem calm and roomy! 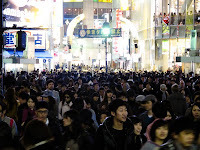 We were told that Harajuku is pretty busy on Sundays, but this was more so than usual. Going down the length of the street, which I would assume would take all of 5 minutes normally, took us closer to 30... the sea of people was neverending, and then when we got to the top by Harajuku station, all you could see were swarms of more people coming off the trains and descending upon the streets. I would still recommend going to experience and see the sights of Harajuku, i.e. the people watching, but be careful of the crowds. 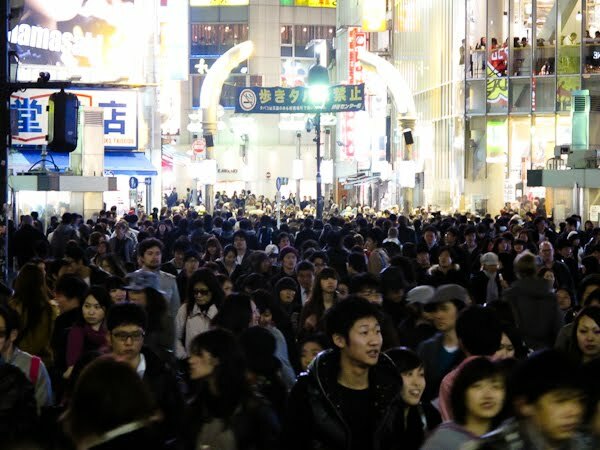 It reminds you that Tokyo is a densely and highly populated city, and I'm convinced I saw them all on that Sunday in Harajuku! The Cherry Blossom (sakura) are in full bloom right now and it is quite the sight to see. The pale pink and white blooms can be seen on almost every street and are a beautiful contrast to the other greenery. Of course, like all things in Japan, this season is to be celebrated and celebrate they do. Over the weekend we took part in a massive Hanami party, which is essentially a picnic in the park under the sakura - but it is a picnic on crack. Literally hundreds to thousands of people gather in parks accross Tokyo all day and into the night with friends (old and new) to eat, drink and hang out. There was a park by our hotel and we were impressed with what people had going on. People put down tarps to sit on along with blankets to fight off the chilly night air. Along side that was baskets of food and cases of beer and wine. And from the looks of it, people would come in the morning to hunt down the best spot and then stay well into the night. On Sunday we were invited to attend a Hanami party with Sayuri. After seeing the parties that had taken place near our hotel, we figured we knew what we were in for... we were mistaken. We knew this was one of the larger parks for Hanami parties, and when we got there the only description I could come up with was that it was the Hanami Woodstock. Literally thousands of people in this enormous park under thousands of sakura trees. It was actually quite remarkable and beautiful, but we were not prepared for the sheer number of people. Getting to this party was quite the adventure -as it was near Harajuku, which was an adventure in and of itself. Unfortunately, it ended up being a pretty cold day in Tokyo, so I don't think we were able to enjoy ourselves fully, but I could definitely see how it would be a great way to hang out with friends and family. If nothing else, I know that crowds do not deter the Japanese and they take every opportunity they can to celebrate. We've been fortunate enough to have (what the boys call) a "handler". Through a friend of a friend (well technically, a friend of a friend's sister) has been gracious enough to show us around and help us navigate the craziness of Tokyo. It has been amazing to have her. Even though Huge's Japanese has been helping us get by, having a native speaker has been advantageous. Yesterday's festivities kicked off after our trip to the Tsukiji fish market. Sayuri met us at our hotel and we were off. First stop, Rippongi Hills. Ripongi is the ex-pat area of Tokyo, so most people will tell you to skip it, but Rippongi Hills is a collection of large muli-floor, multi-purpose buildings (But HUGE). We first went to the top to see a 360 degree panorama view of the city. Although probably a very "touristy" thing to do, it was definitely a great way to see how the city was laid out. Then it was lunch time... in the basement of one of these buildings, the four of us went for some delicious ramen. I could eat this every day! After walking around we decided that we needed a bit of a nap as we had a big night ahead of us. Sayuri came back to meet us and we took the train to Shibuya. This is the typical picture people have of Tokyo -the enormous intersection with hundreds/thousands of people crossing at once with the neon lights ablaze. Coming out of the train station was pretty overwhelming. And crossing the street was an experience like no other. It was like crossing during rush hour at Times Square, but times a thousand. Literally a sea of people. *click on image to enlarge and get the full effect! Dinner (well, first dinner) was at a tasty, but trendy isakaya. Kind of tapas style, but they had the most delicious fresh tofu. After we tried to find this little restaurant we had read about in Lonely Planet. Believe what people say, it is IMPOSSIBLE to find places in Tokyo. There are street signs (sparingly), but there are no numbers... so even if you have an address, it's really hard to find places. After asking a few people Sayuri finally found the place, Sakanatei. It was on the 4th floor of this unassuming building, but they had really traditional Shizouka food. It was a very relaxed place and definitely off the beaten path. 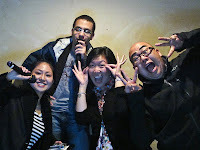 Sayuri had a friend playing at a club, but we had a lot of time to kill, so we did the most stereotypical Japanese thing to do -KARAOKE! 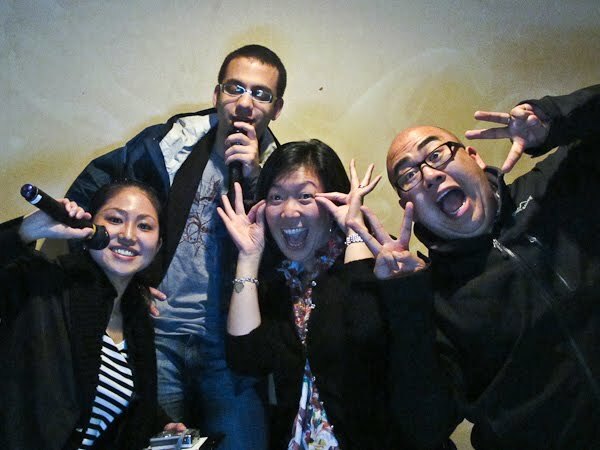 I'm not sure it was any different than karaoke bars in North America (with the private rooms), but being in Japan made it that much more special. Finally around 1 am we went to a club to hear Sayuri's friend play. I can't remember the last time I was out at a "club" at 1 am, but when in Tokyo, do as they do. It was definitely an insiders kind of place, as it looked like you were walking into someone's basement, but it was definitely fun -and we were definitely the only non-Japanese. Unfortunately we're old, so we didn't make it to hear Sayuri's friend (Mista Donut) spin -he wasn't on until 3:30 AM! So we headed back in a cab around 3. I'm still pretty proud of us for making it that late! Tokyo nightlife definitely is crazy -the only thing I could do without is the indoor smoking. It's hard to believe it was like that in North America only a few years ago! Today started nice and early. At 5 am we got up and got ready so we could head to the famous Tsujiki Fish Market. Let me just say, this was amazing! I've been to lots of markets, but this was like no other. The hustle and bustle of this place at 6am was something to witness. And we got a glimpse into the famed tuna auction. It's what I imagine the floor of the stock exchange to be like. Someone stands on a box over the tuna being auctioned and then in a flurry of Japanese and waving papers, the tuna is sold. Also, they are not joking when they say how busy it is... I realize this is a working market, but the amount of motorized and manual carts zipping around the place is incredible. You completely feel in the way, but it's definitely not something to miss. After we had to go have sushi for breakfast and at some whole in the wall we were able to get our fill. Yum! Huge will post pictures later, but I'm incredible glad we got to experience the market, and we're thinking maybe we'll head back another time on the second leg of our trip! So we arrived to Tokyo last night... after an 11 hour direct flight from Chicago, we were tired and ready to get to it. Because of our changed flight (which worked out really well for us in the end -originally supposed to be on a connecting flight via Seattle, we snagged a direct flight for a few hours later when the threat of mechanical problems threatened our ability to catch our connection), we got into Narita airport a little bit earlier than planned. So we waited for Jon to get through immigration and then we had to wait an hour for our bus (we opted for the "limo bus" instead of taking the train due to travel exhaustion and rush hour craziness, that we just weren't ready for yet!). After arriving in our hotel and checking in without a hitch, we decided to go grab some food and beers. This ended up being harder than we expected... The first place we went to was a small hole in the wall. With Huge's Japanese, we were able to order a couple of beers and two of the house specialties. It was a risky move, but worked out in the end as we got a few chicken dishes, a couple of skewers and some interesting (intestine?) soup. After that good experience, we thought we'd try our luck and go somewhere else to experience something else. That's where things got interesting. We were turned away from TWO RESTAURANTS! They explained to us (in English) that they didn't speak English or have English menus. We were ok with that as we were just going to wing it, but it clearly wasn't acceptable for them. Sigh... we ended up in a ramen shop where we placed our order from a machine and then sat at the bar to wait for it to be delivered. I will say that it was delicious and after being turned away from the other places, we were happy they were willing to help us. Hopefully this doesn't set the mood for the trip, but it will be interesting! Thank goodness for Huge's Japanese! hope to update a bit while I'm there so stay tuned. Until then sayonara!